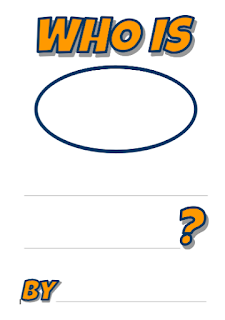 The Book, "Who is Melvin Bubble" by Nick Bruel is such a fun book to read to your students, and is a great template for having them write their own version of the book. I have also included a copy of the presentation I put together to help students learn how draw themselves as a Melvin Bubble style cartoon. I found the best way to use this was to email the link to the slides to the whole class and then have them go through it by themselves when they get up to the illustration stage. A short time ago I posted about creating Choose Your Own Adventure stories using Google Slides, you can view that here. It is such a simple project, but one that is so engaging and fun for students. We followed the same template as we had before for a choose your own adventure, except this time we themed it for the Flat Stanley Project. 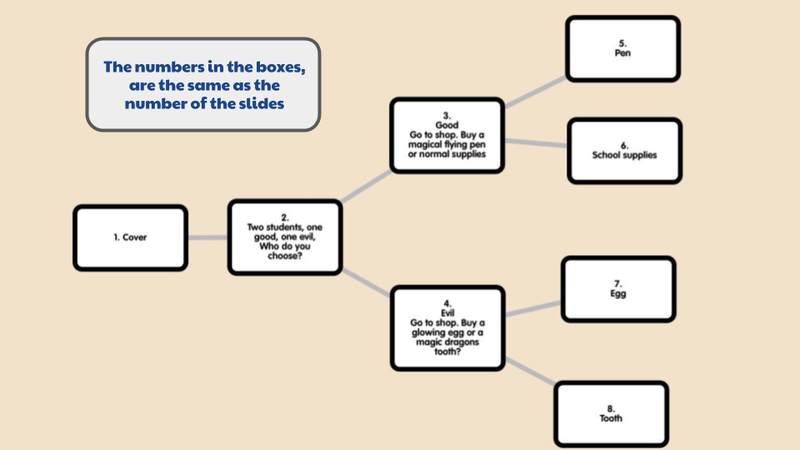 Below is a copy of the planning Popplet I created for my own story, and the final version of my Flat Stanley story. You may notice in the planning document that I kept the numbers in each planning bubble the same as the slide number that information is on in the slide deck. This is important as it helps students when they are linking their files. This was a great project, and a different way for our students to teach someone else about our home of Singapore. Click this link to make a copy of the template file I send out to students. Clicking on this link will create a copy of the document. You can copy and paste this link if you want to share it directly with your students. I was recently working with a class that was making ABC books, and decided to try and pimp out a Google Slide deck for the job. I'm really happy with the results, particularly the hyperlinked letters around the edge so you can jump to any letter, and the design overall. Second language instruction or with English as a second language learners. Click here to make a copy of the slide deck for your own use. I remember reading Choose Your Own Adventure books a lot as a child, in particular the "Your Very Own Robot". I'm sure I read through that book 20-30 times, choosing a different path each time. 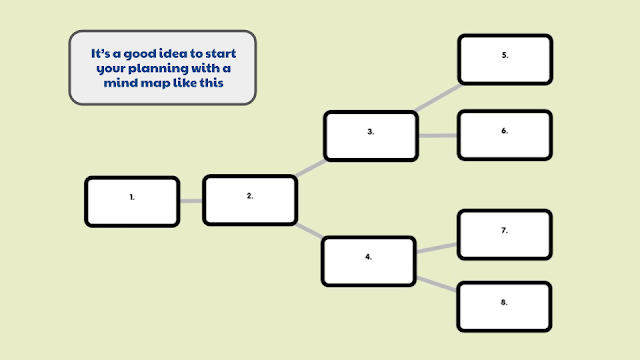 For that reason I have always liked the idea of giving my students the chance to create their own Choose Your Own Adventure stories using hyperlinks. 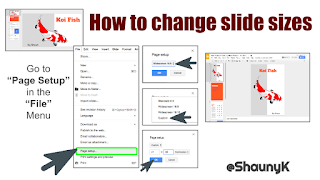 There are a few ways to do this, but the best way I have found is using Google Slides. It's simple, free and platform agnostic. Below is an example of a story I wrote myself. The last 3 slides have the planning documents that I use with the students. Planning - The most important step! Planning out how the story flows is very important when you do this for the first time. 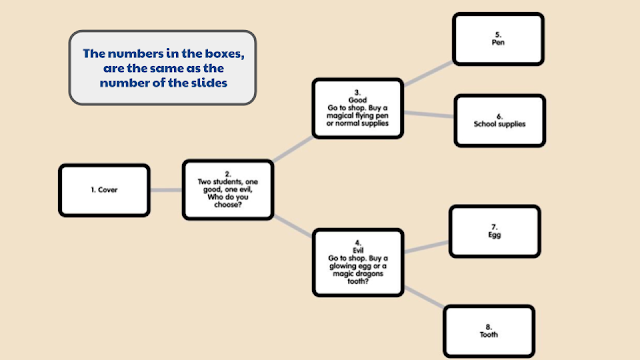 I use Popplet with the students, but you could simply use a piece of paper. If you look at the image below I number each step so that it is the same as the slide number in the presentation slide deck. It's important that students can see how the story flows and which step links to the next. Once you have highlighted the text, right click and then click on link. 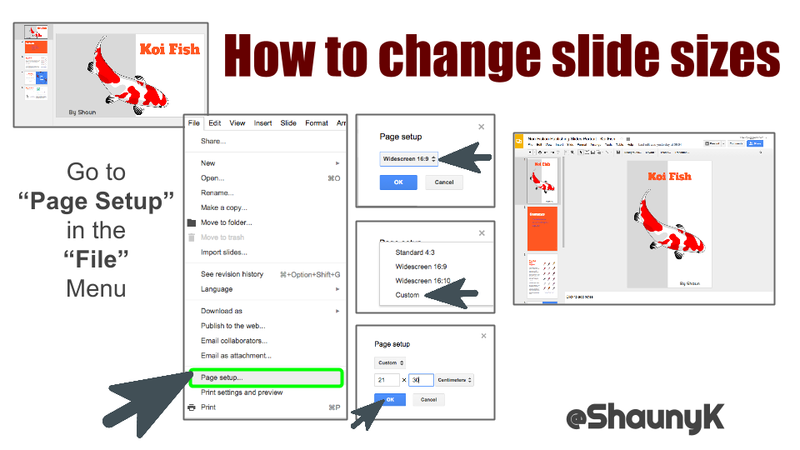 In the link pop up you can choose "Slides from this presentation instead" and click on the slide you want to link to. Another reason that I like this option for creating choose your own adventure stories is that Google Slides embed very nicely into student blogs, and as I mentioned at the start, are platform agnostic so you can read them on any device. Using hyperlinks is an important skill for students to understand and this project is a great way to teach students how to use them and gives them some starting ideas on how they can be used. Stop motion is one of the most rewarding and fun creative outlets the iPad provides. There are super simple apps to use and the effects are great. I personally use Stop Motion HD from Cat Eater, here is a link to download it. Stop motion is a great way to get students to visualise their learning, as well as engaging them in a creative and challenging activity. Check out my video below which gives you some ideas about how to get started with Stop Motion. When I was in the classroom report time was not my favorite time of year. I could never think of the words to get started, and it was all a little overwhelming. At the same time I have always been fascinated with spreadsheets, and so put these two together and over the last few years I have come up with this spreadsheet that basically writes reports for you based on a comment bank that you set up yourself. This new version puts the student name and gender pronouns using a basic code (### for their name, and #his/her etc for the pronouns. Here is a direct link to the spreadsheet, and embedded here is a short video that will tell you how to use the spreadsheet. If you have any questions you can find me on Twitter @shaunyk or leave a comment on this post. Making the ultimate WANTED poster using Google Slides. It was a great lesson and resulted in some terrific outcomes. I also gave students the option to use iPad apps such as "Over" or "PicCollage", but most of them ended up using Slides. Embedding documents into Blogger is not always completely straightforward, particularly when you want to embed a PDF, so I made a set of 5 videos to help out with this very issue. 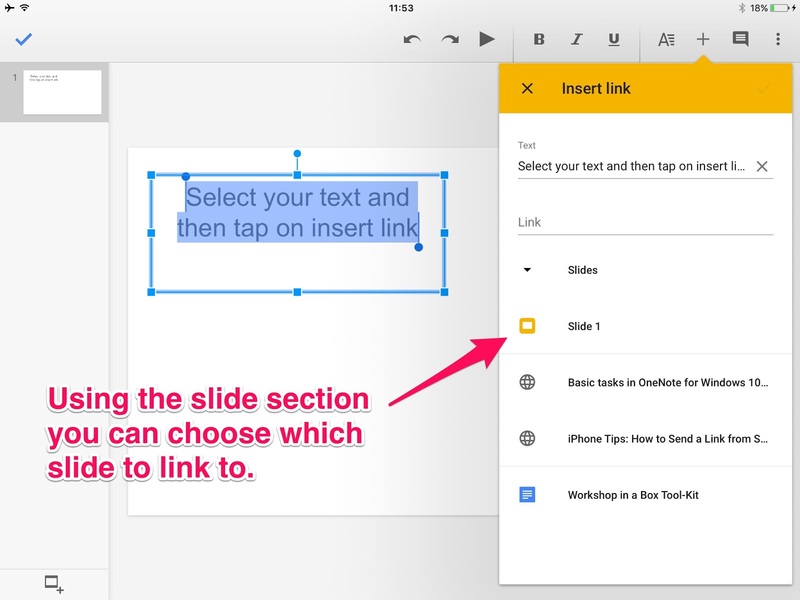 From embedding Google Docs & Slides, to PDFs. I also made a couple of videos to explain how to adjust the width and header of your blog. Check out the embedded playlist to see the videos. Students love video effects on the iPad, and this one is a great effect to make it look like you can magically move things with your thoughts. It is super simple and uses the free app "Reverse Vid" following is a very short video which explains to students how to do this on their iPad. If you make one it would be great if you could link a copy to it in the comments below. With an increasing focus on data, and pure academic achievement, fun is often pushed aside to get through more material. I’m personally concerned that many people overlook the amazing levels of engagement that come along with fun, and the opportunities to teach students almost without them knowing they’re learning. And more than this, when learning is fun, it becomes intrinsic. Following is a recording of a speech I gave recently in Manila outlining my thoughts on the importance of fun at school. There’s nothing too revolutionary about using slides to publish books, however it is good to remember some of the great advantages it has, and think about some new options you may not have considered. Adding captions, or creating labelled diagrams is quite easy. To make a portrait book in slides, it’s as simple as finding “Page Setup” section in the file menu. Using the custom size option, you can put in the measurements for an A4 page for instance (21cm x 30cm). There are lots of bad examples of Gifs online, equally balanced with amazing examples as well. In fact it is possible to use a free iOS app like “PicPlayPost” to make your own animated Gifs from videos on your camera roll. These can then be put in student books and will play automatically when embedded in their blog. Below are examples of books that I have published using this method, as well as links that will create copies of these presentations if you want to use them for your own purposes. Click here to make a copy of the Landscape book. The iPad summit at ISKL has been a great event. Following is a copy of the presentation I used during my iPad bootcamp, it could be helpful if you're running training or would just like some tips yourself. Having a stable iPad stand is one of the most important tools you need for making Stop Motion videos, and is also super handy for lots of other occasions. Here is a super quick video which will show you how to make your own iPad stand using only cardboard, and a couple of minutes of your time. This is a great activity as a beginner maker space project with kids. I've been using drawing apps with my kids at school recently, and wanted to give them the chance to draw with a stylus rather than their fingers. I ended up making a super cheap and easy Stylus for the iPad using just a pencil and some foil. It was really that simple, all you need to keep in mind is that the stylus needs to stay pretty vertical, as the iPad is designed to have a nearly 1 cm contact patch, hence the end of a pencil is perfect. It's a simple idea for classroom use if you're using drawing apps, as it's super cheap and easy. I hope it works well for you too. Recently MIT released Scratch Jr for the iPad, which is a great platform to introduce younger students to the ideas behind Scratch, which is widely used in upper elementary and middle school for game creation and so much more. For the week of Code, I am using Scratch Jr in our lower elementary classes and created this presentation that you can use in your classroom to get started with the program. Using apps like Book Creator is a great way to get kids creating their own content, but it is not always easy to share these home to parents. To help out with this I am sharing the method I use with my classes, incorporating Google Drive and a simple link sent home to parents. The following two videos go through the steps for a teacher to set up the process, and the second tells parents what they need to do when they receive the link in their email. As we come back to school and start out with our respective technology programs, a very important part of that program is to ensure that we cover digital citizenship. My school has a 1:1 iPad program from 1st grade onwards, so our first lessons with the students are really focused on that digital citizenship piece. To start out we keep it very simple, but stress the importance of some simple rules that will help keep students safe online, our equipment in one piece and forms the basis of our acceptable use agreement. Below are the 5 simple rules that we have adopted in first and second grade with all classes. It's a simple set of rules, but has enough flexibility to cover almost any situation that may come up in class. This poster was originally by Kelli Buxton in my team and has been well received by teachers and students alike. 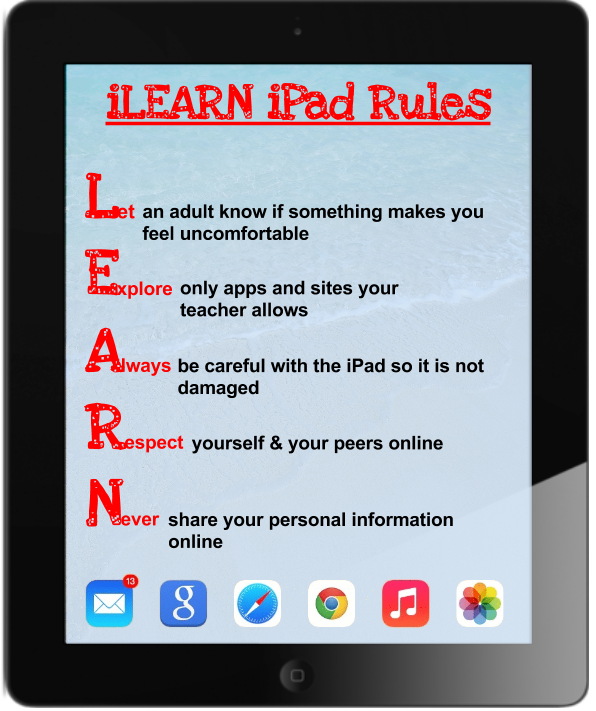 We have put a copy of this poster on the cupboard or trolley where the iPads are stored so it can be referred to if necessary. Adding individual events to a Google Calendar can be annoying and time consuming. But there's a super easy way! Using a simple spreadsheet in the form of a CSV file you can upload as many events at one time into any of the calendars that you manage. There is one big warning! Be careful when you set it up as there are only two ways to delete the events you put in, either delete the whole calendar or delete the events one at a time. In that regard I'd advise adding a new calendar to house all of your new events, or at least test the file in a temporary "Test Calendar". These are the basic instructions, there is also a step by step YouTube instruction video below. There is a second video at the bottom of this post that shows you how to set up the spreadsheet to accommodate multi day timetables (like a 6 day cycle) that don't stick to the days of the week. Hopefully this will save you quite a lot of time! 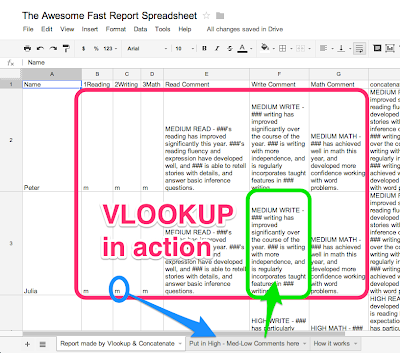 The Awesome Fast Report Starter Spreadsheet! It's that time of year again when teachers need to write reports. 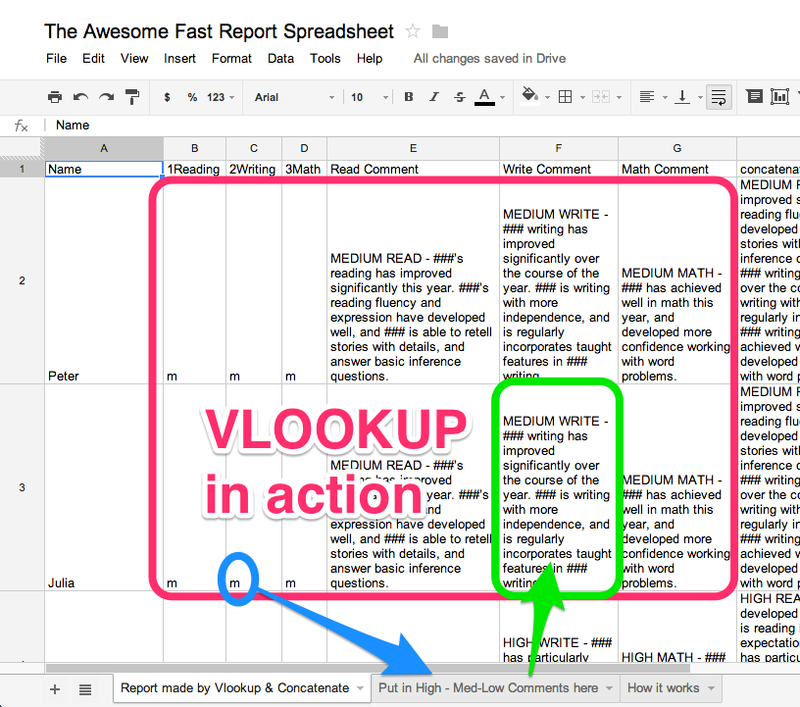 When I was in the classroom I always had trouble getting started, so I created the "Awesome Fast Report Starter Spreadsheet"
Click here to get a copy of the "Awesome Fast Report Starter Spreadsheet"
It uses just a few basic functions to compile together, the Vlookup function which searches for information in another table based on a value existing, Concatenate which joins text together, and Substitute which swaps out the wildcard ### for the student's name. This is a great way to get started on your reports, and a practical way to use spreadsheets to get started with your reports. As a disclaimer putting in high, medium and low comments is not the end of my report writing. Once I have my spreadsheet start I then go and edit the prepared comment, adding personal examples, next steps, pronouns and other individual feedback. If you find this useful I'd love to hear back from you either on this blog or via twitter where you can find me @shaunyk .